This year I plan to really make the most of our garden. It's a decent size and was one of the reasons we chose to move to this house from our old apartment, but so far we haven't done much other than keep on top of the weeds and put a hanging basket by the front door, and we have been here for nearly 3 years! Oops. I saw this clip from Phil Spencer: Home Hero where he shows a family how to make the most of their garden and I am now feeling super inspired! I really want to get the children involved in gardening and plan to grow some vegetables and maybe some fruit too. My grandparents taught me a lot about gardening, especially growing vegetables, when I was a little girl. I remember how exciting it was to pull up my first crop of potatoes and pick my first harvest of cherry tomatoes. Beans are really easy to grow, and they grow quickly! I'm planning to grow a vegetable teepee by putting three long bamboo poles in the ground in a triangle shape and tying them together at the top. I plant my bean seeds straight in the ground, so will put five or six seeds around the bottom of the poles and they will simply grow up them, creating a fabulous teepee to play in as they grow! I adore butterflies and Ian is a fan of bees, so we like to encourage them. We have a lot of lavender in our front garden which the bees and butterflies love. I plan to grow some butterfly-friendly plants in our back garden too, to provide them with somewhere to lay their eggs as well as a food source. I hope we'll be rewarded with lots of caterpillars to show the boys and have a garden full of beautiful butterflies and bees over the summer. Last year I bought a fat-ball holder to feed the birds, but I think it will be fun to try to make a birdhouse instead this year! We get quite a lot of birds in our garden including some very friendly robins, and the boys love spotting them. We also get frogs lay their spawn in our pond every spring which is brilliant, I get more excited than the boys do as they start changing into tadpoles and then frogs! I can't wait for spring so I can get out there and get started. Do you have any plans for your garden this year? Do your children like to get involved? Fab idea. We grew some bits last year that then got attacked by squirrels so going to try again this year! 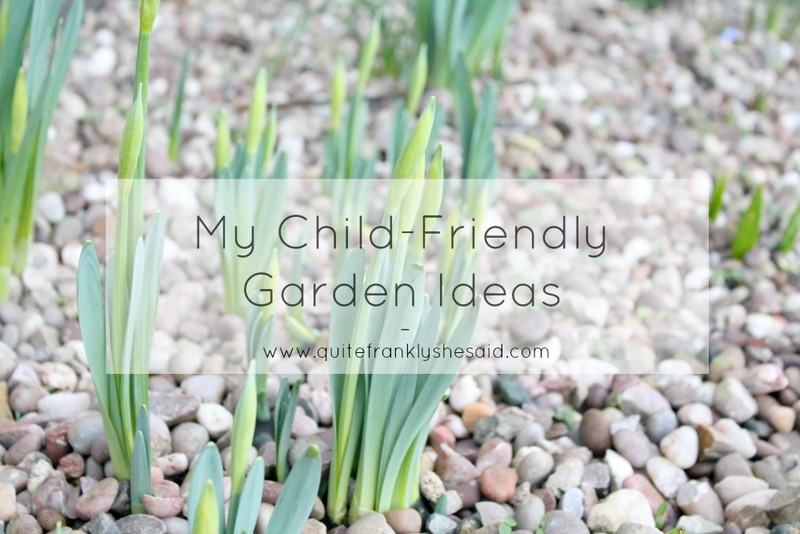 I really want to get my little boy involved in the garden! I'm trying my hand at a few fruit and veg (strawberries, onions, leeks) this year, and hoping that he can enjoy eating them, and then maybe next year he'll be old enough to get a bit more into it. I'm thinking it'll be nice for him to have his own space to grow something himself. I'd like a child friendly garden. Unfortunately ours is a little back yard with loads of stones and not that friendly either! I am goign to plant flowers and build a safe pen for the Robot to play in as he is starting to crawl! Great ideas! Thanks for sharing. There are plenty of benefits to gardening with your children.It will help them build up knowledge of the nature, engage in a lot of interesting and fun activities and grow beautiful flowers or delicious healthy food and vegetables.